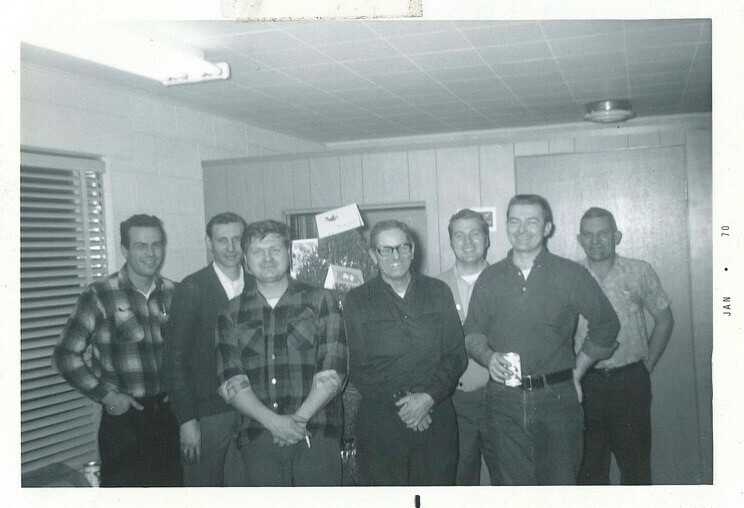 Founder Pat Thompson pictured 3rd from the right at the first company Christmas party. As part of our 50th year celebration, Pat Thompson is honored to share six of the milestone events that have shaped our organization into the company we know today, starting with our origin story. Trans-Matic has an interesting history. We have a lot to celebrate after 50 years. After graduating from college, I worked for a small deep draw manufacturing company in Chicago—Drawn Metal Products—from 1962 to 1968. It was a good company, owned and managed by a wonderful gentleman, Joe Zapf. I learned a lot working out in the shop for over a year before working in purchasing and sales. When Joe was getting ready to sell the company to our biggest customer, I decided to move on. And when I couldn’t find another job paying the money I was making, I decided to start my own business: Trans-Matic. The decision to start out in Holland, Michigan was one of the best decisions we ever made. We had a good workforce with Boy Scout virtues, low cost of living and close access to industrial markets throughout the Midwest. Nevertheless, it was a humble beginning. We sold our house in Chicago, cashed in a few modest investments and borrowed funds from our family to start the business. I quickly discovered that while it was easy to sell for Drawn Metal Products, there was resistance to selling for a start-up like Trans-Matic. We were new, inexperienced and undercapitalized. My family went eighteen months without a paycheck. I worked part-time weekend jobs to put food on the table. It would take six years to get back to what I was earning at my previous job. We worked nonstop six and seven days a week for six years before we could afford to take our first vacation. It was a stressful period of exhausting work and economic uncertainty. It took ten years of sweat equity before the business was properly capitalized, and we came close to bankruptcy twice during that start-up period. I almost collapsed. After working 10-12 hours per day six and seven days a week, traveling around the country calling on customers during the week, running machines on the weekends and earning no salary, we made exactly $699. No one said starting a business was going to be easy. You can download the Trans-Matic origin story by clicking here.